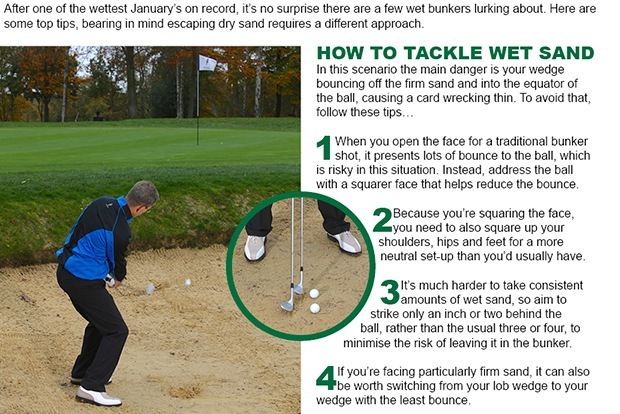 Hello again golfers and welcome to our latest newsletter, we've just had another wet weekend but there are definite signs that the new golf season is getting nearer, there's a bit more warmth in the sun when it does come out the and mornings are much lighter with the evenings becoming longer. Many golfers associate the first major of the year the Masters Tournament at Augusta with the start of the season and that is now just six weeks away! 'Golf is like a love affair. If you don't take it seriously it's no fun; if you take it too seriously it will break your heart'. There's a bonus point available for the first reader to tell me which character from a famous 1980's TV series this quote is attributed to, click here to tell me your guess. Will you take on our distance challenge? Weather conditions made for a very wet February Stableford on Saturday, well done to all the members who turned out despite incessant rain all day. The poor weather made the scoring even more impressive as Steve Holehouse won with 43 points. 15 handicapper Steve was flying after nine holes with 24 points including two early birdies but as the downpour didn't relent it was a case of holding on to a good score on the back nine and he returned a very creditable 43 point winning score. In second place was Stuart Gray with 42 points, Stuart also had two birdies in his round and he seemed to play better the wetter conditions became, he fired a fantastic 23 points on the back nine! Big Andy Dodd also battled well through the rain to score 41 points including an impressive two's on holes five and eleven. As you can see from the photos despite the wet weather our members still seemed to enjoy themselves! The next competition is the March Medal a week on Saturday, the Winter Order of Merit is nearing an end and with just two events left it's Dave Johnson who sits at the top with a healthy eight point lead over Paul Underwood. 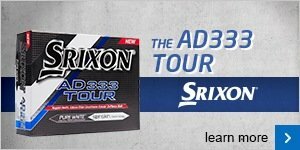 How does a free 3 wood of your choice sound? There is nothing more rewarding for us than helping a golfer improve their game through a custom fitting session and in many cases the improvements that can be made are quite considerable, this has inspired us to come up with an exciting new challenge for all of our readers! We're introducing the Hartford Distance Challenge and the premise is quite simple - we want to find the person who increases the distance on their drives the most through a custom fitting session with us. For all fitting sessions using our launch monitor figures we will have a leader board on which we will note how far on average you hit the golf ball with your current driver and then the average distance with a new correctly fitted driver of your choice, we can then see who has picked up the most distance with their newly purchased driver. Of course there will be a nice little reward for the challenge winner, the player that picks up the most distance will win a FREE fairway wood to match their driver! The challenge will run from now until Sunday 10th April - which coincides with the last day of the Masters Tournament. So if you've never had a driver fitting before or you've got an old driver that isn't performing now is the perfect time to visit us, we can virtually guarantee you more distance and you could well win a nice new fairway wood to match your driver completely free of charge! Click here to register your interest in the Hartford Distance Challenge. Here's Steve Hulse looking very relaxed in his buggy on a recent golfing trip to Spain, maybe the night before was catching up with him?! If you would like to book a slot for a free fitting please contact us here. The boxes full of new products keep arriving daily in the shop at the moment, we were rather excited to see these brilliant new Odyssey White Hot RX putters, many of you will know that Odyssey are the number one selling putter brand in the country and their success has largely been built on the famous super soft 'White Hot' insert in the face that was amazingly first introduced over 15 years ago. A couple of years ago Odyssey also came up with another innovative face design called 'Metal X' in which the face had a criss-cross mesh like finish to promote better roll of the ball on the green, so Odyssey had two great face designs and the next step has been to blend the two together in the new White Hot RX putter series. So in simple terms these new putters have a super soft feel off the face coupled with a design that will get the ball rolling smoother and eradicate any skidding, on top of this Odyssey still have some of the most famous putter head designs in golf such as the iconic 2-Ball, Versa, #7 and #1 models and also in ladies versions. The putters we are stocking come with the very popular oversize SuperStroke grip designed for Odyssey in a cool black and white finish. These putters are also very reasonably priced starting at just £129, call in to the shop to have a look through the new range and we can also give you some advice about which model might suit you best. Last week we showed you the video of leading tour player Bubba Watson effortlessly hitting drives of over 340 yards whilst testing out his new custom fitted Ping G driver, and at Riviera last week at the Northern Trust Open he showed that not only does he drive the ball a massive distance but he also hits the fairway more often than not and he has a deft short game to boot. Around one of the hardest courses the PGA Tour will use all season with a tough set up of narrow fairways and tricky undulating greens Watson beat off a high class field including Adam Scott, Dustin Johnson and Rory McIlroy, whilst world number one Jordan Spieth surprisingly missed the cut. Bubba Watson has had his critics in the past and he recently kicked up a storm when he said he didn't like the TPC Scottsdale course whilst he was playing the Phoenix Open but there is no denying his sheer talent and ability to hit shots others can only dream of. As one journalist perfectly put it Bubba is 'like an artist on the golf course and his pink shafted driver is his brush'. In case you missed it last week have a look at this cool video from PING when they fitted Watson for his new driver. Whilst you might not be Bubba long we reckon that the new PING G driver could help your game too and even better we are retailing them at a mega low price of just £279, if you would like to book a custom fitting session please contact me here. It was really great last week to see so many children around the place during Half Term, Adam Powell held a number of coaching sessions with kids of all ages and abilities attending - especially popular was his Junior Day Camp in which he took a group of 9 budding golfers through all aspects of the game culminating in a round of golf with Adam on hand to give guidance. We firmly believe here that junior golfers are at the heart of the game and its future, as such we have an unbelievable junior membership offer that we think simply cannot be beaten! We want to show that golf doesn't have to be an expensive sport - junior membership starts at a bargain price of just £65 which is for full 7 day membership here and at Pryors Hayes for kids aged under 11, under 18's pay only £100. We're not sure why the seniors are so lucky but they always seem to get nice weather on a Tuesday morning! This week was no different as they played an 18 hole Stableford bathed in wintry sunshine, the winner was none other than our Honorary President Colin Maddock with a whopping 45 points! 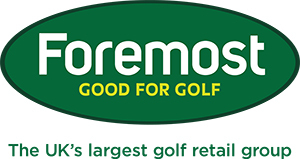 It's been a while since Colin's name featured at the top of the leader board but he showed a welcome return to form this week, he got off to a perfect start with a birdie on the second hole and a run of pars on the back nine helped Colin amass a healthy winning total. In a distant second place was the in-form Alan Nevin with 39 points and third place went to Steve Tomkinson on 38 points. Next Tuesday the seniors play a nine hole Stableford. Playing with worn and shiny grips makes it difficult to produce a fluid and reliable swing - which leads to mishits and inconsistent ball-striking. 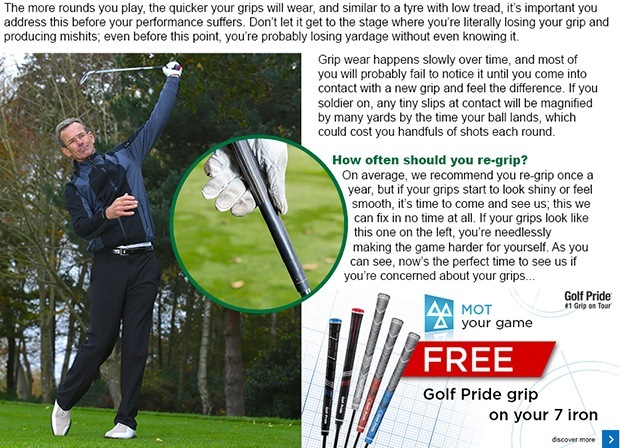 Come and collect your FREE Golf Pride grip in store and we’ll re-grip your favourite iron. You’ll feel the difference immediately. Are you losing your grip?